The Balfour Declaration was sent 100 years ago this week. This week marks the 100th anniversary of the Balfour Declaration. And while it was only 67 words long, it changed the course of history. The letter declared British support for the establishment of a Jewish homeland in British-ruled Palestine. At the time, less than 10 percent of the region's population was Jewish. The letter specified "nothing shall be done which may prejudice the civil and religious rights of existing non-Jewish communities in Palestine." Historians aren't sure why Britain decided to support the Zionist movement. Theories range from colonialist ambitions to anti-Semitism to a desire to keep the U.S. and Russia in World War I. By 1939, Britain started capping Jewish immigration to Palestine. But by then Jews made up more than 30 percent of the territory's population, and they had the beginnings of a government. This is where history picks up steam: In 1947, the United Nations began the creation of Arab and Jewish states. The next year, Britain ended its mandate in Palestine. On that same day, the Jewish Agency declared the creation of Israel. And the day after that, troops from neighboring Arab states invaded the newly formed state in defense of the Palestinian Arabs. Arab states started out occupying Palestinian areas not given to Israel by the United Nations, but they did capture part of Jerusalem controlled by Israel. By the end of the war, though, Israel managed to occupy a large amount of partitioned Palestinian territory. 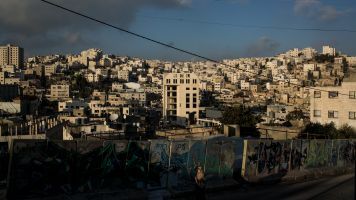 That war lasted about a year, but it displaced more than 700,000 Palestinians, creating a refugee crisis that still informs a lot of the tension in the Middle East today.